The Laird (Ebenfeld) Mennonite Brethren (MB) Church, located in northern Saskatchewan one mile south and three and one-half miles east of Laird, was a member of the Canadian Conference of the Mennonite Brethren Churches, Rosthern District. Elder David Dyck began visiting some of the first Mennonite immigrants to Saskatchewan between 1896 and 1897. Through his efforts and instruction the first Saskatchewan MB Church was organized at Laird in 1899 with approximately 60 members. Until churches were established in other areas, members came (not every Sunday) by horse and wagon from as far away as the Hague and Brotherfield districts. Worship services were held in the forenoon and Sunday School in the afternoon. Isaak Neufeld, a deacon from Russia, and C. K. Gloeckler were the first leaders. A church building was erected in 1899 at a cost of $583.00 and dedicated in December of that year. In 1900 Jacob B. Wiens, a minister from Kansas, became the leader of the church. In the winter of 1911 to 1912, a short course Bible school lasting six weeks was conducted in March and April by John F. Harms and C. N. Hiebert. At that time the Christian Endeavour was also initiated with John B. Fischer as the first chairman. The church building was moved into town in 1911. The English language came into use in one Sunday school class in 1931 and after that the German language gradually changed to English. Worship services in 1949 were in both the German and English languages. On 5 November 1970 the Ebenfeld MB Church officially closed because the active membership had become too small to function effectively as a church. Laird members joined the Waldheim MB Church. A cairn has been erected on the site of the former church in Laird. The original cemetery still exists at Ebenfeld four miles east of Laird. Center for Mennonite Brethren Studies. "Laird MB Church." http://www.mbconf.ca/home/products_and_services/resources/published_genealogies/mb_provincial_conferences_and_church_congregation_records/saskatchewan_archives/laird_mennonite_brethren_church_archives/ (accessed 21 November 2009). Toews, John A. A History of the Mennonite Brethren Church: Pilgrims and Pioneers. 1975: 158. Available in full electronic text at: https://archive.org/details/AHistoryOfTheMennoniteBrethrenChurch. Centre for Mennonite Brethren Studies, Winnipeg MB: Volume 638, Reel 12. Epp, J. H., Marlene Epp and Richard D. Thiessen. 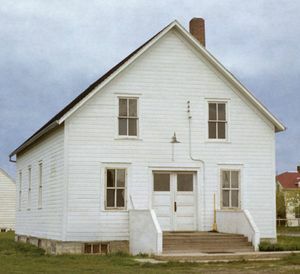 "Ebenfeld Mennonite Brethren Church (Laird, Saskatchewan, Canada)." Global Anabaptist Mennonite Encyclopedia Online. November 2009. Web. 22 Apr 2019. http://gameo.org/index.php?title=Ebenfeld_Mennonite_Brethren_Church_(Laird,_Saskatchewan,_Canada)&oldid=163468. Epp, J. H., Marlene Epp and Richard D. Thiessen. (November 2009). Ebenfeld Mennonite Brethren Church (Laird, Saskatchewan, Canada). Global Anabaptist Mennonite Encyclopedia Online. Retrieved 22 April 2019, from http://gameo.org/index.php?title=Ebenfeld_Mennonite_Brethren_Church_(Laird,_Saskatchewan,_Canada)&oldid=163468. Adapted by permission of Herald Press, Harrisonburg, Virginia, from Mennonite Encyclopedia, Vol. 3, pp. 268-269. All rights reserved. This page was last modified on 9 March 2019, at 03:34.